Cozy pizza joint with a wood-fired oven is an offshoot of chef Salvatore Olivella’s No. 28 in New York City. : Olivella's is a bustling Park Cities spot opened under the tutelage of chef Salvatore Olivella, a native of Naples and veteran of the New York pizzeria scene. 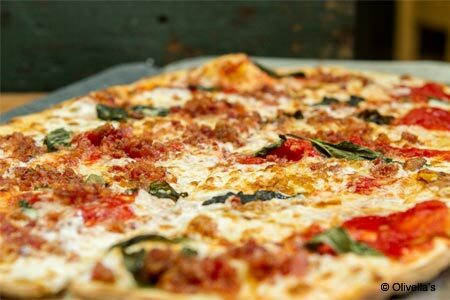 Owner Charlie Green follows the Neapolitan method, baking the pizzas in a wood-fired oven to create a classic Neapolitan style crust: thin in the center, browned to a crisp on the edge. Toppings include house-made mozzarella, meats imported from Italy and bright, fresh and chunky San Marzano tomatoes. A great way to start off a meal is with the sushi Parma, spicy little bombs of mozzarella wrapped in prosciutto and scallions. We also recommend the prosciutto di San Daniele pizza paved with mozzarella, arugula and Parmigiano, shaved off the giant wheel behind the bar. The quick cooking time ensures that the ham remains moist. If you can’t decide on a pie because they all look so good, try the classic margherita. Go early, or expect a wait.